The following was originally published as a chapter in the book, Twitter for Museums. Do you have “permission to fail”? Failure can be a valuable learning and evaluation tool. The first challenge for anyone using Twitter is figuring out what you want (and can realistically expect) to gain from it. The second is measuring movement towards those goals using data that are accurate and relevant. If you’ve ever used a 3rd party Twitter analytics tool, you’ve probably experienced bewilderment in trying to interpret a metric that is clear as mud—what do “clout,” “amplification score,” “link quotient,” or “influence ratio” really mean? These flashy stats are easy enough to acquire—you typically visit the (often free) analytics site, type in your username (many don’t even require a password), and watch it spit out your data. Gathering metrics that are actually useful and actionable is a different story. As you start gathering metrics, remember that both quantitative and qualitative data are important to your evaluation plan. Quantitative data can help you understand the degree of engagement (i.e., how many?) but that’s only one piece of the puzzle. Qualitative data helps you understand the kind (i.e., positive? negative? neutral?) of engagement. With Twitter, both types of data are abundant and easy to access. What’s harder is overcoming information overload and making analysis both manageable and useful. Another challenge for any evaluation activity is avoiding measurement for measurement’s sake. You want to the do the least amount of work needed to gain actionable insights. You want to spend your time acting, not analyzing. Having a plan for data gathering and analysis will help you maximize your time. The plan outlined below is described with Twitter in mind but will be most worth the effort if you use it to integrate evaluation of all your social media objectives. Twitter is all about keeping it short and simple. So why should your evaluation plan be any different? The 6 steps outlined below will help you maintain a constantly improving presence on Twitter. Step 1: Listening: What are people saying about you? What aren’t people saying about you but you wish they were? Search for your name and phrases related to your museum. Step 2: Benchmarking: Where are you now? Where are your peers? Save baseline data: followers, @ replies, RTs, clickthroughs. Make a list of 3-5 peer institutions. Record their metrics for followers, RTs, etc. At regular intervals, record this data again (for you and peers). Step 3: Thinking about goals: Where do you want to go? What is your definition of success? Jot down a few (4 or less) goals. Consider aims related to influence, engagement, relationships, and effort. Step 4: Measuring: What data should you collect? How can you collect it? Record measurements of input (the effort you put in) and the response (feedback you receive). If you can, use Web analytics and audience research (e.g., surveys) to understand how your Twitter efforts are impacting behaviors on your Web site and in the offline world. Remember that data with context is more useful (e.g., change over time, percentage of how many). Perform a content analysis—use a random sample or tweets from a small time period and categorize them by message type, tone, or topics. Step 5: Analyzing: How do you make sense of the data? What kinds of analysis should you focus on? Step 6: Actionable reporting: What does it all mean? What is the best way to share this information? What are you going to do? Determine your direction. Develop SMART objectives and action steps. Create a dashboard that clearly states your objectives, trends, and next steps. Share your successes (and improvement needs) with decision makers and other colleagues. They say the most brilliant conversationalists are actually brilliant listeners. Since Twitter is all about dialog it makes sense to begin by listening. In their book, Putting the Public Back in Public Relations: How Social Media is Reinventing the Aging Business of PR, Brian Solis and Deirdre Breakenridge advise that: “Measurement is most useful when you have something to benchmark against. Running a current audit of the state of your brand perception helps you create an accurate baseline and also reveals the opportunities for engagement.”2) In other words, what are people saying about you and what could they be saying? Where are you now and what is in the realm of possibility? Analyze your mentions (tweets that reference you). Choose a way to save tweets and then tag or categorize them. For example, bookmark individual tweets in del.icio.us (each tweet has its own unique URL4, click on the timestamp to see it) and give them tags that are meaningful to your museum (e.g., positive, negative, question, comment, locomotive). By looking at how many tweets are associated with each tag, you’ll get a sense of conversation density. If you’d rather do it offline—or if you find a very large number of mentions—a spreadsheet might fit the bill better. Make listening an ongoing part of your Twitter efforts. Goals (Step 3) are about knowing where you want to go and how you will know if you’re successful. But how can you know where to go unless you already know where you are? Your baseline is your “line in the sand.” Flickr photo by Egan Snow. Your listening activities have given you a sense of what the conversation looks like. This is your “baseline” or starting point. You may have been tweeting for some time before you realize you forgot to capture your baseline?that’s okay! Just measure it, record it, and call it your baseline?no matter when you start recording. You’ve got to start somewhere. Other baseline data to consider: search engine rankings for particular terms (e.g., when you Google search your museum name, you’re result #1; when you search “Julia Child” you’re result #4) and Web site traffic (e.g., visits, unique visitors, referrers from Twitter). Your social media activities can have wide-ranging impacts on your Web presence. Record those things that you care most about “moving the needle” on. Benchmarks help you understand where you are in relation to something else. They are points of reference, standards by which your efforts can be measured or judged. Flickr photo by JACoulter. If a baseline marks the “line in the sand,” a benchmark helps you know where something is in relationship to that line. Make a list of 3-5 peer institutions on Twitter, including one with stats that blow everyone else out of the water (e.g., MoMA or The Women’s Museum).6 GraphEdge is a good tool for discovering who else your audience is listening to; it presents a list of other users ranked by what percentage of your followers also follow that account. For each peer on your shortlist take a look at their follower numbers, how actively they’re tweeting, etc. Capture only the details you want to focus on in your own efforts. Save this data as a benchmark for comparison and to help you develop realistic objectives. The next time you measure your own statistics—say, one month from now—you’ll record them as new benchmarks. You can then compare your new data points with your peers’ data as well as your own baseline. Recording benchmarks at regular intervals (e.g., monthly, quarterly) makes measuring progress—and extrapolating into the future—easier. When you’re brainstorming goals, consider not “What can I do on Twitter?” but “How can Twitter help me achieve the museum’s mission?” Ask: “What is unique about Twitter?” and, more importantly, ‘”What can I bring to Twitter that is unique?” If it’s true that Twitter is awash in navel-gazers and spam-loving marketers, museums have a fantastic opportunity to provide everyone else with fresh, exciting content and distinctive modes of engagement. Your task in Step 3 is to develop a few (4 or less) big picture goals. You will learn a lot about your museum’s effectiveness on Twitter after you go through your first round of measuring and analyzing data. When you get to Step 6, you’ll have a fuller sense of context and will be better equipped to articulate objectives. Many frameworks exist for organizing social media analysis?choose one (or create your own) that best presents how Twitter efforts relate to your museum’s mission and values8. The framework presented below offers four genres of activity that a museum might wish to measure or improve on: influence, engagement, relationships, and effort. You will learn more about analyzing measurements in Step 5. You already know that you don’t need to measure everything that’s measurable. The list of measurements outlined below is a menu for you select from—don’t eat everything on the menu or you’ll be sick. Choosing tools: Beware data puking! As Web analytics guru Avinash Kaushik puts it: “Most Twitter analytics tools just…find numbers that can be computed and then proceed to puke at you as many as they can find, with wonton disregard of value being provided or outcomes being measured.”9 Indeed, the plethora of opaque metrics available to you—like “social ratio” and “passion score”—can make you dizzy. Focus on the metrics that will help you achieve your goals. In his excellent Web Analytics 2.0 chapter, “Measuring the New Social Web,” Kaushik writes, “One of Twitter’s great gifts to humanity is its open API, which has fostered hundreds of applications that provide metrics.”10 While his praise might seem hyperbolic, the number of 3rd party tools created to measure and interact with Twitter is truly astounding. The variety and the cost (usually free) are the upsides of this phenomenon. The downsides are systems which output metrics that aren’t always accurate or meaningful and applications that seem to go as quickly as they came. So, what data should you collect? And where and how can you collect it? In order to prioritize your social media efforts and become more efficient, you’ll need to measure not only audience behaviors but also your own. At the end of the day, you have more control over what you’re doing and saying. How many employee hours spent on Twitter? When do you tweet (day/time)? What percentage of the tweets you send are original content? @ replies? RTs? Have you run any special campaigns or calls to action? What are the dates? Have you changed your Twitter background design? Have you changed keywords in your Twitter bio? Are there external events that might trigger a change (e.g., exhibition opening, news story)? What are people doing on Twitter? What is the tone or sentiment of what they’re saying? What behavior is exhibited by people who visit our Web site when they are referred from Twitter? How does this behavior differ from other audiences? Do our Twitter followers visit the museum? Do they purchase items in the store? Provides a rough measurement of awareness and potential influence. Gives you a better sense of how many people (followers and nonfollowers) are actually engaging with you and your content. Shows you change in engagement and reach over time. Calculate rates and ratios using a spreadsheet. Behavior analysis tells you what people are doing and the degree to which they’re doing it. Content analysis, on the other hand, tells you what they’re actually saying and whether the tone is positive, negative, or neutral. Before you can analyze content you’ll need to collect your sample. Use the same methods you used in Step 1 (Listening) to gather tweets that reference your museum. For more granular control of results, try Twitter.com’s advanced search14 which allows you to specify words, people, places, dates, attitudes, and whether or not the tweet contains links. You can filter out irrelevant results by using the minus sign in your query (e.g., “-root” when searching for “beer”). Keep in mind that Twitter restricts the size of your search by placing a date limit (approximately 1.5 weeks) on the updates you are allowed to search.15 Other 3rd party tools offer the ability to conduct an advanced search, save and export results, receive updated results via email or RSS, and more. If Web analytics data are crucial to your evaluation plan, you’ll need to take some extra steps to make your tracking more accurate. By looking at site referrer data in your Web analytics tool, you will see visits coming from Twitter.com. Unfortunately, traffic from desktop and mobile Twitter clients (e.g., HootSuite, TweetDeck, Tweetie) does not register as a Twitter referrer because traffic is not coming from a browser; instead it is recorded as “direct traffic.”18 The same is true for traffic that comes from RSS feeds. In order to capture information about these visitors on your site, consider appending your URL with tracking parameters (e.g., with Google Analytics URL Builder, you can specify campaign, source, medium, and name). Make sure to do this before you shorten your URL. You can capture a lot of qualitative data through content analysis. But if you’re looking for information that can’t be gleaned from observing what people do and say through Twitter you will need to use audience research tools. Collecting data from different audience groups allows you to compare the impact your Twitter efforts are making on attitudes and actions. What are the audience’s expectations? Are they being met? Who are they? Collect demographic data as well as information about whether they are members, donors, etc. How have the museum’s Twitter efforts influenced perceptions? What kind of follow-up actions have been taken (e.g., visited the museum, made a purchase, became a member)? Do these actions have any relationship to exposure on Twitter? You’ve collected and measured and categorized to your heart’s content. Now, how do you make sense of the data? How do you pull it all together? A metric is a standard measure that quantifies a trend or characteristic and helps you assess performance (e.g., new followers). When you’re elbow-deep in data, keep in mind Avinash Kaushik’s advice to focus on the “critical few.”19 Essentially, this is the process of separating the “nice to know” metrics from the “need to know” metrics. Remember, you don’t want to suffer from “analysis paralysis.” Measure what you need to and then spend your time where it counts: on Twitter! Followers: Keep an eye on how your follower numbers grow over time. Obviously, a growing number of followers (quantity) is good. More important, however, is gaining followers that are relevant and engaged with your content (quality). You might also pay attention to specific campaigns or events that led to a marked increase in followers (e.g., Were you retweeted by an account with a huge number of followers? Was your Twitter feed featured in a news story?). Retweet ratio: To calculate retweet ratio, divide the number of retweets of your content by the number of tweets you sent. The closer you are to 100% (or more), the greater the reach of your content. Looking at which tweets were retweeted most gives you a sense of the kind of content your audience is most interested in sharing with their networks. Make sure when calculating number of retweets that you are including the various formats people use in their tweets (e.g., “RT @username,” “via @username,” etc.). To compare yourself with your peers (regardless of their follower size), consider your ratio of retweets in a given time per thousand followers. Clicks: Link shortening tools (e.g., ow.ly) illustrate click trends over time and can help you isolate which tweets were most interesting to your audience. Are blog posts the most highly clicked? Fun facts? Conversation ratio: To calculate this metric, compare your total number of mentions to tweets sent. The closer you are to a 1:1 ratio, the more your activity on Twitter is like a dialog rather than a monolog. You might analyze this data to see how many questions you’re asking versus answering and what kinds of tweets are generating the most response. Make sure you are performing qualitative analysis on the conversations to determine that the engagement is positive. Percentage of followers who retweet: To calculate this you’ll need to take the number of unique retweet senders and divide that by the total number of followers you have. Remember, you want relevant people to follow you on Twitter. If the percentage of retweeters drops significantly over time, this might be a sign that you’re not engaging your followers as well as you could or that you’re gaining a lot of followers who are not relevant. Conversions: The question you want to answer is, “How many people who clicked on a link in Twitter took a desired action?” The desired action might be a visit to your blog, subscribing to your newsletter, or becoming a member. Or you might simply want to compare how much time people referred from Twitter spend on your site versus time spent by those who come from elsewhere on the Web. Are your Twitter followers more engaged than those who find you in a Google search? Satisfaction score: If customer service is important to your organization, you’ll want to calculate satisfaction score by subtracting the number of negative mentions from the number of positive mentions you receive and dividing that by the total number of mentions. A higher percentage could indicate a more satisfied public. Churn rate: Look at the number of followers you gain or lose in a given time period. There is a churn rate associated with many kinds of communication (e.g., email newsletters) so keep a closer eye on the trend than the absolute number. Your churn rate trends are a reminder to not just focus on growing the size of your list but to make sure that you’re reinforcing value for those already on your list. Tweets sent: How many tweets do you send on an average day? Does the number (or day of the week, or time of day) affect the response you get? You will need to determine the appropriate amount of time to spend on Twitter; the quantity and quality of response you receive should be a key factor in this determination. Time spent: Keep rough tabs on how long it takes to create new content for Twitter as well as how much time it takes to seek out and respond to people. Is one employee responsible for all Twitter activity or can you spread the workload around the museum? Now that you’ve completed your analysis, it’s time to show how your evaluation informs what the museum should do with the data. What is the best way to share information about your successes and highlight the areas where you need additional support? How can you foster success and growth? How will you keep your content fresh and your followers engaged? Where will Twitter fit in your priorities? As you think about the answers to these questions, consider what your objectives should be and begin drafting action steps to meet those objectives. The purpose of the SMART framework is to ensure that your stated objectives are clear about what you want to do, how you’ll quantify it, and what your time frame is for achieving it.23 Because social media is developing and expanding at such a rapid rate, your objectives should be relatively short-term and you should measure them on a monthly or quarterly basis. Note that many 3rd party tools show stats only for the last 30 days, so you’ll want to check and capture data on a regular basis (even if you don’t analyze it until later). Increase followers to 10,000 by June. Convert 10 followers to donors by the end of the year. Increase traffic to the blog from Twitter to 1,000 visits per month. A dashboard report can help you visualize and track trends, showing how activities align with your goals. Dashboards provide an effective way of answering questions quickly and concisely: What’s changed? What can I act on? What should I pay attention to first? Twitalyzer’s dashboard is pretty to look at but doesn’t illustrate what you’re supposed to do next. Unless your museum is using Twitter as its sole social media outlet, you should consider integrating all of your social media analysis and reporting into one framework. A dashboard that quickly and clearly demonstrates the success of your social media efforts as a whole will be hugely useful in determining how your museum values (and allocates resources to) those activities. You also might decide to use more than one dashboard—one that is detailed for the people closest to the work itself and another that is a rolled-up synthesis for senior decision makers. By integrating evaluation and learning into our everyday work, we can change course quickly and midway, constantly improving our efforts. Your reporting helps steer the ship in the right direction but don’t forget to revisit your evaluation plan itself. Do your goals need to be adjusted? Are you measuring too much or too little? Are there more efficient tools available? As social media evolves, so too will the ways we think about the role it can and should play within our museums. Evaluation reminds us to put our visitors (not ourselves) at the center of our work. Joseph Jaffe, president of new media shop Crayon, warns of the danger in looking at your social strategy as a checklist: “This can put too much emphasis on tangible metrics like the size of their Twitter and Facebook followings, losing sight of more important intangibles, like expressing empathy, listening and acting human.”26 Jason Falls, author of the Social Media Explorer blog, agrees: “The core reason social media programs are successful is because they’re about people, not money. 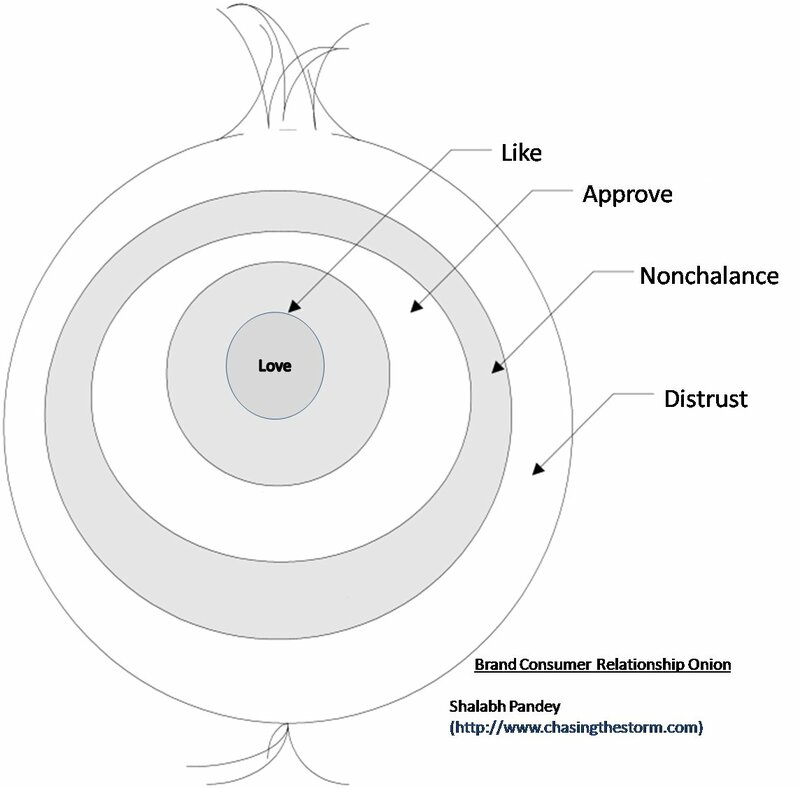 Look at the social media buzz words—community, conversation, dialog, sharing—all of them are people-centric, consumer-centric.”27 Don’t abandon your instincts, emotional intelligence, or playfulness. Ideal outcomes like goodwill and loyalty are human responses to interactions with other humans, not calculators. Kanter, Beth. “The New ROI — Listen, Learn, Adapt: Return on Insight – Does it work for nonprofits?,” Beth’s Blog: How Nonprofit Organizations Can Use Social Media to Power Social Networks for Change. January 9, 2009. Kaushik, Avinash. Web Analytics 2.0: The Art of Online Accountability & Science of Customer Centricity. Indianapolis: Wiley Publishing, 2010. Zarrella, Dan. The Social Media Marketing Book. Sebastopol: O’Reilly Media, 2009. 2. Solis and Breakenrige, 258. 3. Find more information about understanding hashtags, see Mashable. 5. Tr.im or ow.ly (integrated with the HootSuite application) are examples of tools that take a long URL and significantly shorten it. They track these shortened links and provide reports on how many times they are clicked. 6. Check Jim Richardson’s Museum Marketing blog for the latest stats on museums on Twitter. 8. For other frameworks, see: Kim; Kaushik, Web Analytics 2.0, 57-59, 266-270; Lovett; Solis and Breakenridge , 254-265. 13. For more on the “Three Zones of Measurement” concept, see Bartholomew. 17. See Gemingrani for more tips on measuring topics and conversation structure. 24. See Solis and Breakenridge, 265, for more examples. 25. 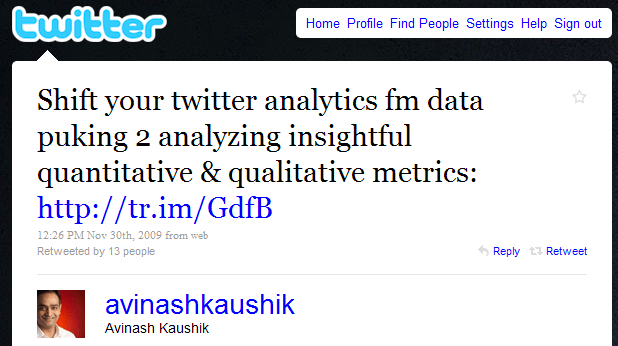 Kaushik, Web Analytics 2.0, 288. Also see a case study of Twitter use at the National Museum of American History, from the same publication.